Sooner or later, we all come to know deep loss, grief, or trauma. In the #1 New York Times bestseller The Shack, now a major motion picture, Author Wm. Paul Young stunned and inspired millions with a revolutionary look at great sadness through the eyes of the triune God. Now he partners with seasoned psychiatrist and family therapist Brad Robinson, M.D., to offer readers an experiential guide to their own personal journey toward renewal after profound loss or pain. 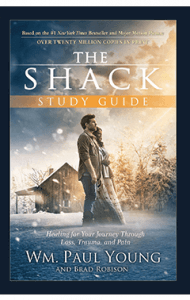 THE SHACK STUDY GUIDE is for anyone – individuals, families, professional counselors, pastors, or grief groups, to name a few – ready to courageously return to the place of their greatest loss in order to confront the truth of who God is and who they are. With excerpts from The Shack, questions to guide personal reflection, and some instructions along the way, this one-of-a-kind guide invites you to join Mack and Papa on a healing journey. Why not begin your journey today?